(APN) ATLANTA — Activists with the Turner Field Community Benefits Coalition (TFCBC) drew a line in the sand on April 01, 2017, when they created a Tent City at the gates of the now-former Turner Field. 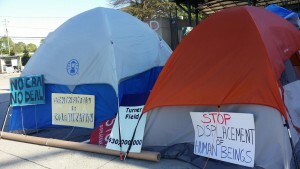 The tents are there to dramatize the crisis that is happening to residents who live around the site of the former Turner Field in Atlanta’s Summerhill, Mechanicsville, Peoplestown, and Pittsburgh neighborhoods. The presence at the Tent City has ranged from twenty to fifty people at a time, as folks rotate between their jobs and living in the tents. They have vowed not to leave until GSU and Carter Developers meets with the Coalition to negotiate a legal binding agreement. Multi-generational families and other long-term residents are being displaced through the forces of gentrification and eminent domain, and do not feel that they have a voice in what’s happening to their neighborhoods. On March 29, 2017, the Coalition recently scored a tentative victory in the Atlanta City Council’s Finance/Executive Cmte, when a majority of members approved an ordinance by Councilman Michael Julian Bond (Post 1-at-large) to create a Trust Fund for the Turner Field communities and to dedicate revenues from the sale of surplus properties in those areas to the Fund. Carla Smith (District 1), Natalyn Archibong (District 5), and Alex Wan (District 6) supported the measure, while Howard Shook (District 7) opposed, and Felicia Moore (District 9) abstained. The Full Council will vote on the measure, 17-O-1080, when it reconvenes on Monday, April 17, 2017. Coalition Members, along with the News Editor of Atlanta Progressive News, met several times with Councilman Bond and were active in the legislative drafting of the ordinance, particularly in two rounds of amendments that were made to satisfy the Committee. Councilwoman Smith has promised to organize a meeting with Coalition Members and Scott Taylor, CEO of Carter, the private developer that owns much of the former Turner Field site. Smith postponed the meeting in late March because she was not feeling well, and said she would reschedule it, but it is not immediately clear whether it has been rescheduled to date. For decades, these neighborhoods have been plagued with mega-developments like the former Olympic Stadium, the former Turner Field, and I-75/85 and I-20 expressways, all which have displaced thousands of mostly Black families and small businesses. “It’s not a crazy notion that people who live in a community should have a voice in the community,” Tim Franzen, Economic Justice Program Director at American Friends Service Committee, told Atlanta Progressive News. Georgia State University and developers including Carter have purchased 68 acres around Turner Field. So far, GSU has refused to meet with the Coalition that represents the neighborhoods who have been negatively impacted by this purchase and is made up of over forty organizations. “All we want is a Community Benefits Agreement (CBA) that is a legal binding contract with the community, developers, and Georgia State University,” Sherise Brown, a longtime resident of Peoplestown and a member of the Coalition, told APN. Several students at Georgia State University have become allies with the Coalition and support residents having more of a voice in what happens to their neighborhoods. “I’m a student and I’m responsible for the displacement of residents because it’s my money from GSU that is being used to displace predominately Black families. We are taking a stand to say we will not allow our money to displace residents through gentrification,” Asma Elhuni, a graduate student at GSU, told APN. GSU, Carter Development, and Councilwoman Carla Smith who represents the area, have been meeting with the Organized Neighbors of Summerhill (ONS) which is an elite cherry picked group that includes a relative of Councilman Ceasar Mitchell, Chair of Atlanta City Council, but ONS does not represent most of the communities threatened with displacement. “If the Mayor, City Council, and the Recreational Authority had done the right thing we wouldn’t be in this mess. They sold the land before the LCI (Livable Centers Initiative) study was finished, so how do they know what the people want?” Brown said. Instead of meeting with the Coalition, GSU and Carter met with handpicked neighborhood groups, especially the Organized Neighbors of Summerhill and Suzanne Mitchell. “I think they (ONS) are getting bamboozled because they are no closer to a signed contractual contract then we are… A lot of what we want is already in their plan so I don’t understand why it can’t be binding to protect everyone,” Brown said. Carter Development has acquired additional property about four blocks on Georgia Avenue. “This is part of the problem, they keep inching down and taking the community of Summerhill, and the City is letting them do it…. They say to hell with us, they going to do what they want to do and walk all over us and take our land and we got to go away,” Brown explained. Even if a CBA is established what prevents the State from using a condemnation proceeding to remove the requirements? They have done this in the past to remove easements, restrictions, and covenants on land they have purchased. I had hoped GSU’s involvement meant that residents would be treated more fairly than were the resident’s of Peoplestown when the city of Atlanta decided to eliminate homes in favor of a man-made pond instead of simply tweaking the location of the pond. I guess I am just naive. Still, it’s hard not to feel disappointed.